Krishna consciousness means an awareness of and affection for the Supreme Person, Krishna. It is the culmination of all forms of yoga, knowledge, meditation, and spirituality. Krishna consciousness is the natural, original, and blissful condition of every individual. Only when we're covered by maya, illusion, do we forget who we are and who the Supreme Person is. We want happiness, but without Krishna consciousness, we don't know who we are or what we're supposed to do. We try to enjoy life through the body and mind, with hit-or-miss results. And we fear death since we don't know what happens afterwards. The practices of Krishna consciousness, or bhakti-yoga, are meant to free us from the root cause of all anxiety by reawakening our normal, eternal spiritual happiness. The process is simple—meditation on the name, form, activities, and qualities of Krishna. Krishna is the Vedic name for the Supreme Person, the source of our existence and the source of all pleasure. He's known by different names in different cultures, but all genuine spiritual traditions agree that there's only one Supreme God. The goal of bhakti-yoga is to recover our natural sense of connectedness (yoga) with that one supreme God by serving Him with love (bhakti). When Srila Prabhupada founded the International Society for Krishna Consciousness in 1966, he chose the term "Krishna consciousness" over "God consciousness" to emphasize the specific, attractive personality of Krishna, who is the Supreme Being mentioned in so much of Vedic literature as the source of all that exists and the ultimate source of all energies. The practices of Krishna consciousness include hearing about Krishna from the Bhagavad-gita and the Srimad-Bhagavatam—which describes His form, activities, and home in detail. Also recommended are chanting Krishna's names, such as the Hare Krishna mantra, eating spiritualized food prepared and offered to Krishna with devotion, serving Krishna's Deity form in the temple, and many other activities meant to keep oneself steadily absorbed in thought of Krishna. Naturally, the more someone adopts such practices, the more Krishna conscious they become. Krishna consciousness is beneficial on many levels. The great sixteenth century authority on bhakti-yoga, Rupa Goswami, says that devotional service brings immediate relief from all material distress, it is the beginning of all good fortune, and it automatically puts one in transcendental pleasure. In the Bhagavad-gita, Krishna says those who achieve Krishna consciousness are situated in boundless transcendental happiness and think there is no greater gain. They attain peace from all material misery, they can know God as He is, and can even live with Him in the spiritual world, becoming free from material existence entirely. Krishna consciousness can benefit everyone, whatever they may desire. Krishna consciousness was spread all over India in the sixteenth century by Chaitanya Mahaprabhu, who taught that bhakti-yoga is the essence of all religion and the most important point taught in all scripture. He radically challenged the established religious views of the time and convinced Hindus, Muslims, and impersonalists alike to embrace the non-sectarian principles of Krishna consciousness; that anyone, from any social status or background, has equal access to God by practicing devotional service. 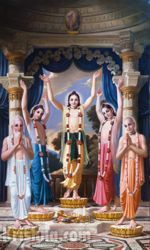 Mahaprabhu also told His disciples to thoroughly study the Vedas and show how bhakti is the sum and substance of all knowledge presented there. Practice of Krishna consciousness isn't dependent on one's personal belief. Anyone can experience the benefits of bhakti-yoga by applying Krishna conscious principles in their life. Those who do so gradually become more interested in eternal, spiritual life and less attracted to temporary, material pursuits (with their related anxieties). In time, with proper guidance, anyone can revive their individual relationship with Krishna and enjoy genuine, uninterrupted happiness. - A worldwide affiliation of Krishna consciousness practitioners. - Simple, sublime, and practical meditations to enhance anyone's life. - The complete science of bhakti-yoga, from beginner to advanced. Read Online. Also available in our Store. "Krishna consciousness means. . ."
- Krishna consciousness means a lot of things. Here are a variety of ways to think about it. - The founder of the Krishna consciousness movement's notes on how to present this ancient tradition for western audiences. "This knowledge is the king of education, the most secret of all secrets. It is the purest knowledge, and because it gives direct perception of the self by realization, it is the perfection of religion. It is everlasting, and it is joyfully performed." "As conscious souls, we have a connection with the Supreme Soul through bhakti, or devotion. Through that relationship we experience perfect knowledge of the Supreme Soul. Since the Supreme Soul is the Absolute Truth, perfect knowledge of Him means perfect knowledge of everything." "Engage your mind always in thinking of Me, become My devotee, offer obeisances to Me and worship Me. Being completely absorbed in Me, surely you will come to Me"
"A person in full consciousness of Me, knowing Me to be the ultimate beneﬁciary of all sacriﬁces and austerities, the Supreme Lord of all planets and demigods, and the benefactor and well-wisher of all living entities, attains peace from the pangs of material miseries." "One can understand Me as I am, as the Supreme Personality of Godhead, only by devotional service. And when one is in full consciousness of Me by such devotion, he can enter into the kingdom of God." 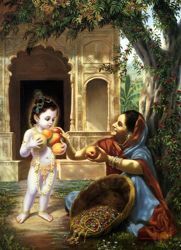 "One should render transcendental loving service to the Supreme Lord Krishna favorably and without desire for material profit or gain through fruitive activities or philosophical speculation. That is called pure devotional service." "Always think of Me, become My devotee, worship Me and offer your homage unto Me. Thus you will come to Me without fail." "Bhakti-yoga, or Krishna consciousness, is the ultimate perfection of all yogas. . ."
(1) Pure devotional service brings immediate relief from all kinds of material distress. (2) Pure devotional service is the beginning of all auspiciousness. (3) Pure devotional service automatically puts one in transcendental pleasure. (4) Pure devotional service is rarely achieved. (5) Those in pure devotional service deride even the conception of liberation. (6) Pure devotional service is the only means to attract Krishna." ". . . In that joyous state, one is situated in boundless transcendental happiness, realized through transcendental senses. Established thus, one never departs from the truth, and upon gaining this he thinks there is no greater gain. Being situated in such a position, one is never shaken, even in the midst of greatest difficulty. This indeed is actual freedom from all miseries arising from material contact." "The supreme occupation [dharma] for all humanity is that by which men can attain to loving devotional service unto the transcendent Lord. Such devotional service must be unmotivated and uninterrupted to completely satisfy the self." "A person who has broader intelligence, whether he be full of all material desire, without any material desire, or desiring liberation, must by all means worship the supreme whole, the Personality of Godhead." "Direct Krishna consciousness is bhakti-yoga. . .Krishna consciousness means to work in full knowledge of one's relationship with the Supreme Absolute, and the perfection of this consciousness is full knowledge of Krishna, or the Supreme Personality of Godhead." "Krishna consciousness means, concisely, to be always engaged in the transcendental loving service of the Lord." "For genuine bhakti to exist, there must always be three factors: Bhagavān (the Supreme Lord), the bhakta (the eternal, subordinate servitor), and bhakti (loving exchanges between Bhagavān and the bhakta)." What is the actual meaning of "Krishna consciousness" ? What are the benefits of practicing Krishna consciousness? Is Krishna consciousness different from Christianity? Is Krishna consciousness a cult? Is Krishna consciousness part of Hinduism? If Krishna is the Supreme Being, why isn't He mentioned in other religious traditions or scriptures?